Art 101 workshops are offered May and October every year. Blacksmithing 101, Glass Blowing 101, Welding 101 and Stone Carving 101. See full descriptions below. Art 101 is a one day field trip experience for high school students offered during May and October each year on SAW's campus. During an Art 101 field trip, students participate in one or two workshops led by practicing artists. Workshops include instruction on safety procedures and fundamental skills for participants to create a work of art in each workshop. During the midday break, students visit the Cary Hill Sculpture Park and tour SAW’s facilities, exploring many contemporary works of art situated on SAW’s 120 acre campus. Students will learn safety practices, proper working temperature, hammer control. Tapering, twisting, and curling will be introduced. These techniques will be used to produce a hand forged hook and/or heart. This is an introduction to what glass is and how to work with solid forms and color. Paperweights and flower forms are a great place to discover this fascinating material. Each student will make something to keep in this fun and informative class. After a brief safety talk and an introduction to the tools and equipment each student will be able to work the Gaffers bench and experiment with the glass. Students will be introduced to MIG welding and plasma cutting. In this workshop, students will observe and try different methods of welding. 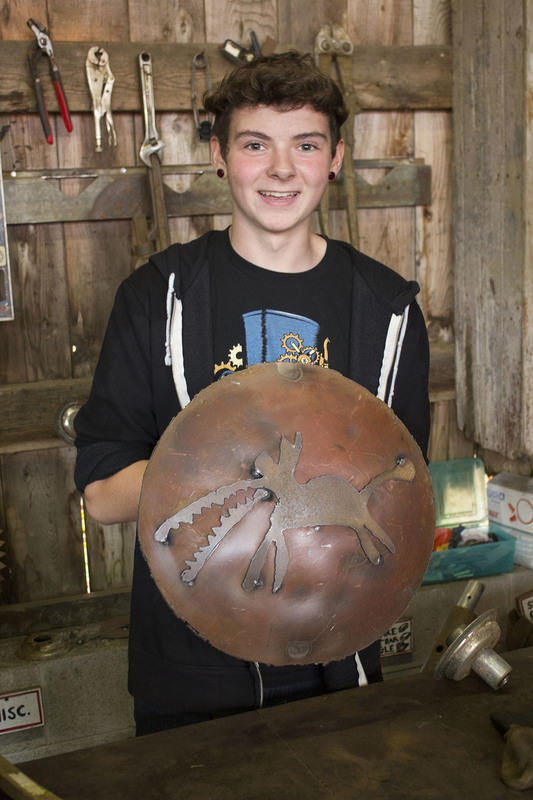 The instructor will provide a demonstration on safe and proper use of a variety of equipment, then students will choose metal scrap material to create a sculpture of their own design. After sculpture is fabricated, students have the option to paint it. Working with hand saws, files, and diamond sanding pads, students will carve a small piece of soapstone into a unique design. It will be based on a plasticine model that they create. Students will also get to try stone lettering techniques. The instructor will discuss geology and local slate and marble industries and their influence on the area. Sessions are offered twice, once in the morning and afternoon. Illegal Activities: All individuals on SAW’s premises shall refrain from engaging in any activities termed illegal by the United States of America, the State of New York, and/or the local community. Any individual who does engage in illegal activities shall immediately relinquish their right to use SAW’s property and facilities. By signing this agreement, the undersigned hereby agrees to hold SAW and its agents, servants, and employees harmless from any and all liability that may result from any acts deemed illegal. These include, but are not limited to: harassment, violence, possession of illegal drugs, use of illegal drugs, and/or underage drinking. On Premises Liability: The undersigned hereby acknowledges and understands that certain areas of the premises involve natural hazards such as hills, ditches, creeks, stone walls, animal dwellings, as well as farm machinery, equipment, barns, stairwells, etc. The undersigned guest hereby acknowledges that each of the above referenced conditions as well as building dimensions, stairways, railings, etc may reasonably lead to damage or injury if they are overlooked in any respect. By signing this agreement, the guest acknowledges that he/she has inspected and accepts the conditions of the premises and hereby agrees to hold SAW and its agents, servants, and employees harmless and indemnified from any and all liability of any manner relating to personal injury or property damage during the time and duration of their use of the premises. Work Exchange and Off-Premise Liability: SAW will not sponsor or pledge security for work exchange or off-premise work programs. The undersigned agrees to hold SAW, its agents, servants, and employees harmless and indemnified for any and all claims of property damage or personal injury resulting from off-premises work or work exchange programs involving the individual. Use of Vehicles/Tractors/Equipment: If a guest chooses to operate a vehicle, tractor, or other piece of equipment, that individual shall first seek written permission from SAW. Guests who choose to operate vehicles, tractors, and equipment after receiving permission from SAW do so at their own risk. The undersigned expressly holds SAW, its agents, servants, and employees harmless for any and all manner of personal injury or property damage resulting from the individual use of said vehicle, tractor, or piece of equipment. By signing this agreement, each guest hereby acknowledges that they may voluntarily refrain from use of any such vehicles, tractors, or other equipment and/or request that a SAW agent, servant, or employee operate and/or drive all vehicles, tractors, and equipment on premises. Recreational Activities/Food/Drink/Utilities: SAW and its agents, servants, and employees will provide ongoing activities on premises for the benefit of guests. As such, each individual signing this agreement acknowledges that activities, food, drink, and use of certain utilities (if overlooked) may involve certain risks of harm based either on manner of performance, the level of ingestion, and/or the use of utilities. The undersigned agrees to take certain precautions and use reasonable care at all times for the benefit of him or herself and those around him or her while on the premises. Each guest shall hold SAW, its agents, servants, and employees harmless and indemnified from any and all manner of property damage and personal injury resulting from the negligent or reckless use of the premises during such activities. Documentation: SAW reserves the right to document its visitors through photographs, video, sound, or any other format. SAW has the right to use this documentary material as it sees fit, including in future advertisements and promotional material. Acknowledgement: The undersigned hereby acknowledges and agrees to follow and abide by the standards of conduct set forth for use of the SAW property. The undersigned has read and understood each term as set forth above and by signing below, the named individual fully comprehends and understands the above terms and acknowledges his or her ongoing duty to comply with the above terms as it relates to his or her use of the property. If at any time the named guest refuses to comply with the above terms, he or she shall notify SAW or one of its agents, servants, and employees, and the named individual shall voluntarily leave the premises without delay.